I don’t know about you, but I hate it when a compendium ends. After playing with a number of fun features that enhance my experience, the game feels somewhat naked. While I understand the intention is to create value for the compendiums, I can’t help but feel that some of the features should be implemented into regular gameplay. As for the exclusive cosmetic items, they should should still be paid for, but the features used to earn points could be implemented in other ways. Before the game began, there was an amount of points you could bet on your team winning. If you won, you would win double the amount of points back. For each week you would have a limited amount of points to bet, so each game was a challenge to place your bets wisely. It was a simple system that would add point to your battle pass and encouraged players to think a little more before playing. This part of the compendium was by far my favorite one and should definitely come back as a feature with one caveat: The won points should used to win a random prize. As of now, players will randomly win a piece of a cosmetic set after a game. It does’t matter if they win or lose, it just happens. The only consistent way of winning any cosmetic item is by using a Victory Prediction gem. While it’s somewhat similar to the betting system, it’s essentially more difficult since you have to correctly predict your team’s victory a set number of times in a row. Should you ever make the wrong prediction, the tracker resets. While I do agree that there should be an effort made to win a prize, I find that these gems don’t make for great value. I propose that the betting system should overtake the gems, or at least the way they are used. Perhaps the gem will have a set number of points you have to win from bets; I think players would be more motivated to buy gems, thus giving them a more concrete value in the market place. When queued for a match, players who bought the compendium would have the potion to play a trivia game. It would test you on your Dota knowledge and give you some factoids on character’s abilities. It was a fun and useful game that helped pass the time. It wasn’t my favorite feature, but I don’t see why it shouldn’t be a regular feature. In terms of cash value, it’s not something I would pay for, but it isn’t something difficult to implement into the vanilla game. I understand if Valve wants to reserve that for paying players but I’d say they should just remove the points won for guessing correctly and leave the base game for everyone. While I’m not a fan for leaving things in the hands of computerized randomization, I will say that I was always excited for the wheel of fortune sporting a Crystal Maiden. 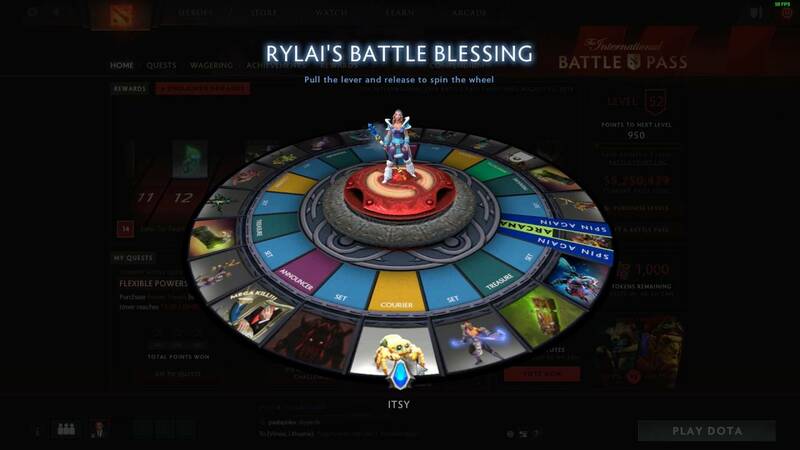 Rylai’s Battle Blessing was a milestone award that would give you a chance to win cosmetic items, even an Arcana set. It was my second favorite feature of the entire compendium. Admittedly, it’s a lot harder to conceive a reason why this should be a regular feature, but I do know how it could be. Like the compendium, the Battle Blessing should continue to be a milestone award, but for leveling up as a player. I think it would be a great way for Valve to show appreciation to its players for staying with the game for such a long time. Perhaps every ten levels, a player could have a shot at the wheel and if the cash value of a prize is too high, they could always switch them out. I know this could be a bit much to ask from Valve, but I’m sure it would be a great show of good faith to the Dota 2 fanbase. With a lot of promises made with no concrete dates and the kick back from Artifact‘s announcement, implementing these features would gain a lot of favor without expending any funds. It’s simply a management of features that adds a new layer to gameplay without changing the game. If worse comes to worse, it could be a limited trial.